Fantasy sports websites DraftKings and FanDuel have abandoned a plan to merge, less than a month after US competition regulators sought to block the deal. The deal would have created a company with control over 90% of the market for paid, daily fantasy sports contests, government officials said. The firms said the deal would lead to greater investment, providing benefits for consumers. They said they would now look to grow independently. FanDuel started in Scotland in 2009 and is now based in New York. It is number two in the US for paid daily fantasy sports contests behind DraftKings, which started in Boston in 2012. The two firms specialise in a subset of fantasy sports, in which fans pick players to create teams for single games, instead of the season, with the potential to win cash prizes based on the outcome. In November, they said they had agreed to merge. Terms were not disclosed. At the time, they said the deal would allow them to combine forces on regulatory issues raised by US regulators, who had compared the industry to illegal gambling and banned the sites in some states. 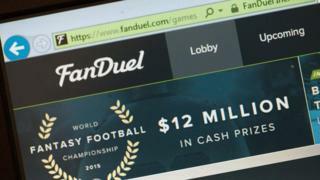 Nigel Eccles, head of FanDuel, said it made sense to move forward independently. "There is still enormous, untapped market opportunity for FanDuel, and we will continue to execute our strategy to grow our business and further expand the fantasy sports industry," he said in a statement. Draft Kings chief executive Jason Robbins also said terminating the merger would allow the firm to "singularly focus" on growth, including internationally. Last year there were an estimated 57 million fantasy sports players in the US alone.